Hailed as the “COP of Action” since before its opening, COP22 no longer holds such promise for agriculture. The scene seemed set for action: the Paris Agreement opened the doors for real progress on agriculture and there were clear commonalities in both country goals and practices. During the negotiations, while there were differences, countries were able to agree on some significant issues and worked hard to reach a decision. However, differences won out and countries were not able to focus on these areas of consensus to reach a substantive decision when the agenda item closed on Friday, postponing discussions until the next negotiations in May 2017. So, how did this happen, and where do we go from here? As parties began to discuss agriculture, they unearthed many areas of common ground. There was a strong sense of urgency and desire for action shared by many countries. Countries agreed on the need to explore policy options to spur action. Countries also acknowledged the need to address climate change through good agricultural practices and to share knowledge and lessons learned. As we wrote in our last blog and analysis, countries are already implementing many common practices, which they shared in their submissions to SBSTA 44. These practices include efficiently managing resources like water, nutrients, and soil, which can have multiple benefits for adaptation, mitigation and productivity. Full negotiating texts were put forward, giving parties a starting ground. This was further than negotiators had gotten since discussions on agriculture started in Durban in 2011. They finally had the ability to address possible points of contention, then to adjust, and finally compromise. The delegates were obviously hard at work in the days leading up to their submission deadline. They met late into the night negotiating a text that could be somewhat acceptable to all parties. After three long days, however, negotiators could not get past fundamental differences. This led to a half-worked upon text that countries decided they could not use as a starting point for negotiations at the next SBSTA in May, losing much of the progress they made this week. and whether there should be a call for developed countries to provide finance and other support for developing countries. While the COP presidency strongly encouraged the Parties to reach an agreement and put pressure by offering clear deadlines, parties were unable to negotiate efficiently. It is clear that both significantly more time and efficiency will be required to achieve real progress on agriculture. There is even stronger urgency and desire for action. Negative impacts of climate change are being felt now for agriculture. Agricultural emissions are significantly contributing to the warming of our planet. Inaction will no longer be an option. This urgency will be made clear on Wednesday, November 16 at the Agriculture and Food Security Action Day during the second week of COP22. Though it was difficult to reach agreement at this COP, countries are starting to acknowledge that many best agricultural practices have benefits for both adaptation and mitigation. Countries are already implementing many good agricultural practices, which they have shared with each other at the UNFCCC and in other international fora. These practices can provide areas of common ground for the next negotiations. Progress, even incremental and painstaking, is still progress. Text was proposed and discussed; valuable contributions and ideas were shared. Parties can take elements of this text, especially points of consensus, to the subsidiary meeting in May. Of course, this is all dependent on the commitment and willingness to engage on agriculture – from all stakeholders. Countries must be willing to focus on common goals between all countries, and also to compromise where needed. EDF and our partners stand ready to provide support and share our experiences in agriculture in countries around the world to reach a decision on agriculture. The interactions between the agricultural sector and climate change have undeniable implications for both global food security and our environment. Despite this global significance, and perhaps due to the complexity of the subject, there has been little progress to date on agriculture in the United Nations Framework on Climate Change (UNFCCC) process. However, this could be about to change. 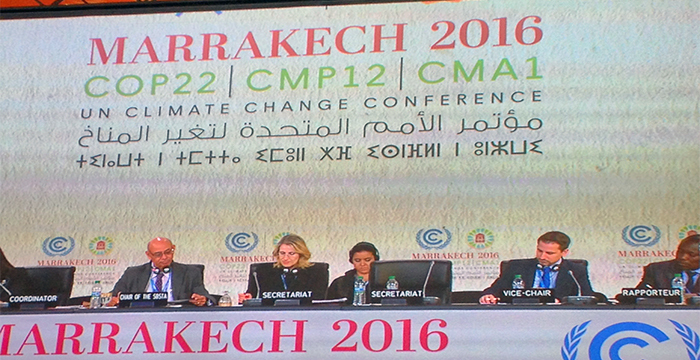 The impetus of Paris Climate Agreement and leadership by the Moroccan presidency could unlock the opportunity to advance agricultural issues at the climate talks, known as COP22, taking place this week in Marrakesh. Furthermore, country actions and targets as inscribed in the Nationally Determined Contributions (NDCs) both show commitment to the agricultural sector and help highlight key common practices that could form a basis for international collaboration. While much of COP22 will be focused on laying groundwork for the Paris Agreement, agriculture could be an area of significant progress in Marrakesh, potentially resulting in a COP decision or work program on agriculture. Agriculture at once contributes significantly to climate change and faces some of the greatest risks posed by climate change. Agriculture is estimated to contribute one-third of all emissions. Conversely, climate change is projected to have negative impacts on agriculture, especially in developing countries. With 800 million people currently undernourished worldwide, the majority of whom depend on agriculture for their livelihoods, and a projected population increase of more than 2 billion people by 2050, it is no wonder that “Zero Hunger” is identified as the 2nd Sustainable Development Goal by the UN and that adequate nourishment is interwoven with almost every goal listed. However, agriculture has yet to be codified within the UNFCCC framework. The Paris Agreement, monumental in more ways than one, identifies food security as a priority in the climate agenda. This recognition is emblematic of the necessity to address the foundation for food security – the agricultural sector – in the international climate negotiations. It is clear from previous negotiations that countries have different priorities and perspectives in considering mitigation versus adaptation. However, it is becoming increasingly clear that these two goals are not mutually exclusive in practice. A new EDF analysis of countries’ submissions to the 44th SBSTA (Subsidiary Body on Science and Technological Advice) finds that countries are employing similar agricultural practices in different parts of the world. Several submissions also noted that these practices can have multiple benefits for adaptation, productivity and mitigation. For example, soil management can increase soil fertility (and therefore productivity) as well as carbon storage in soils. Improvements in livestock such as diet management could both increase productivity and reduce methane emissions. The efficient management and storage of water could also increase resiliency to drought and reduce reliance on irrigation. These are just a few examples of commonly identified agricultural practices that meet both goals of adaptation to climate change and mitigation of emissions. In addition to common practices, it is also clear that the vast majority of countries, driven by national interest, are committed to taking actions on agriculture in the context of climate. Within countries’ INDCs (intended nationally determined contributions), 80% include agriculture in their mitigation targets and 64% include agriculture in adaptation strategies. Parallel to the negotiations, the Global Climate Action Agenda will highlight agriculture and food security on November 16th, demonstrating leadership by the Moroccan presidency to advance issues on agriculture at COP22. With clear necessity and urgency, a way must be paved for work on agriculture issues within the UNFCCC. The Paris Agreement, INDCs, and common practices from SBSTA submissions that countries are already implementing could provide a foundation for countries to work together on agriculture. The best outcome of Marrakesh would be a COP decision on agriculture. International cooperative action on agriculture is in the best interest of all countries due to critical importance of food security, adaptation, and climate stabilization. In addition, international collaboration could facilitate accounting for emissions towards INDCs and accelerate deployment of finance for agriculture. We hope that negotiators will work constructively together on agriculture inside and outside of the negotiations, especially on areas of common ground such as the practices mentioned above. EDF and our partners will be closely following the agriculture negotiations at COP 22 and meeting with negotiators to discuss how to move forward on agriculture issues in the UNFCCC.